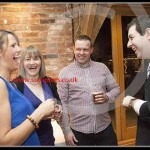 Alex Michael, award winning magician has been performing at private parties, weddings and childrens parties in an around Castle Donnington for well over 10 years. Alex has performed at well over 1000 events worldwide and has such has built up a solid reputation for being one of the best magicians in the UK. At weddings Alex is comfortable mingling and amazing guests either between courses or if the room is being ‘turned around’ or you are having extra guests it is a great time to add the wow factor. Along with magic for adults, Alex can also perform for children, either as a strolling setting or as a formal show where children help out with the magic. Alex is fully insured, CRB checked and is fully recommended for any event.